This very sweet Mozambique Lemurian quartz weighs 7.4 oz and measures 3.5" by 1.7" by 1.7" with an irregular but healed base that is spotted with a druse of golden healer stained little students. She is a lovely light smoky with an opalescent quality to her and finely-drawn Lemurian lines gracing her sides and has some striking golden healer inclusions on two sides that gives her smoky golden tones. Her secondary growth covers three faces and is snow white with sparkling rainbows underneath … a loupe will help you see them well. Her uncovered faces show really neat glyphs and record keepers! She is pristine, particularly for a Moz, and is SO ready to work with her Keeper. My friend, Debbi, introduced me to Mozambique Lemurians and it’s been a love-affair ever since! When I got my first one, she was also coated with a similar white layer, but once she was activated, she cleared rapidly and shows no trace of it now. In working with this Spirit, I was careful not to go too deeply with her so that her new Keeper can have the pleasure of activation and witnessing the transformation. Unlike the Pink and Russian Lemurians, the Mozambiques would not win beauty contests. They have a much more ancient feel and a much more rugged look. Typically, they are dinged and scarred, but their energies are so huge that it doesn’t matter. 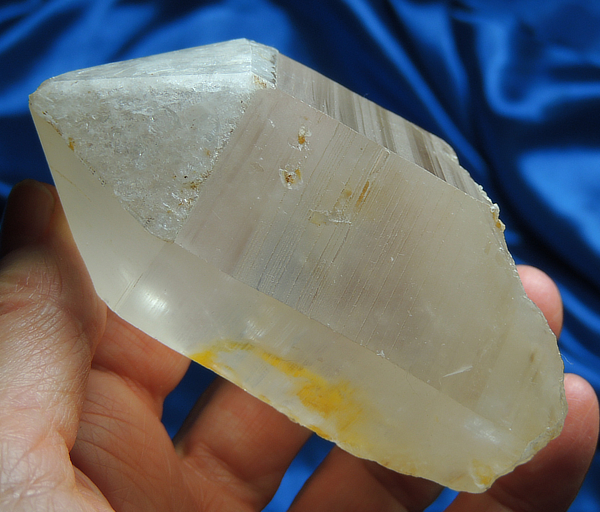 They carry the highest vibrations of the quartz family and even more than phenacite and petalite. Bottom line, to work with a Mozambique Lemurian is to surrender your life to Spiritual evolution and your Higher Self. They are capable of catalyzing great change, hence the nickname ‘Soul Shepherd’. Generally, the energy from a Moz is huge and sometimes difficult to ‘hang on to’ until you get used to it. This Spirit is slightly different – she is much more protective and cognizant of the need to sometimes slow down. She really wants to bring her new Keeper into an understanding of the past so that critical changes can be made in the future. As I said, she is anxious to activate and I am sure that she will clear almost within days once she is with her proper Keeper. She reminds us that the best is yet to come when we allow change as a vital and essential part of our life.